Since the 1982 debut of the Honda Accord in the U.S. its seen many different styles of there inline 4 cylinder. It wasn't until 1995 that the v6 showed up and started to “WOW” Accord fans. Now over 20 years later it looks like the v6 will be taking the back seat to the inline 4 cylinder once again. If you are an Accord lover like me and you have an inline 4 than chances are at some point you longed for the power of the v6. Some even wanted it so much that they would go through the trouble of ripping out the 4 cylinder to swap in the 6v. Power hungry Accord fans have been modifying there engines ever since I can remember so when the v6 started launching in the Accord it changed things, it became the mod. Sure, you could slap a fancy cold air intake or exhaust on your 4cyl maybe even a turbo or an ECU tune, but all those things could be done to the v6 as well and yield greater results. I too must admit that at some point I wished upon a star that my Accord came with a v6 to play with. The accord has a long history in the U.S. being the first U.S. produced car from a manufacturer in Japan. Not to mention holding the title for the best selling car in the states many times over. So it seems like we've worked our way up to the v6 and its DOHC power. So now after all this time why are we seeing it fade away? I would have to say it comes down to the advancement of technology. Everyone wants fuel efficiency, but most don't want it at the cost of performance. We all know gas prices can change without warning. That's why I think they took out the option of a v6 and gave the 4 V a turbo. Even the base model get a turbo! I feel they wanted to make it more economical while still providing performance. It also gets a new redesigned transmission to help all these things come together. So don't despair about losing the v6 in the new accord. It should still be a fun peppy car to haul your family around in with the base model producing 192 horsepower. Most people (like myself) I would assume want a certain level of fun out of driving there car. No guy wants to buy a minivan they would rather cart there family around in a gas guzzling SUV of some type just for fun factor alone. With the new Accord you should get the best of both worlds. Fun and economical plus I got to say I'm excited to see a base model with a turbo. If you are a Honda Accord owner or an enthusiast please let us know how much will you miss the v6. Please write your opinion in the comments section below. If you liked this article and think it may help your friends, consider sharing or tweeting it to your followers. Honestly I think honda has made a big mistake dropping the v6. Currently an owner of a 8th generation v6 6 speed accord and dont think I could ever go back to a 4cyl ever. Even with their new 4 cyl turbos I can pull more power out of my 10 year old accord than I could a new turbo accord coming from someone who has owned nothing but hondas my whole life I have no intention on staying brand loyal with my next purchase. Honda has focused on pulling as much power put of a 4 cyl to keep fuel economy but no longer cares about maintenance and upkeep cost nor longevity for their customers purchase. I work in the shop at a dealership and can assure you the upkeep on the factory forced induction is going to cost more in the long run than what they are saving in fuel economy. That reason alone has forced me to look into other brands. I'm sorry to hear you will be changing your car brand. Although I must agree with you on some points you made here. Still I hope you find something with Honda that will keep you interested in them. I have to say that I agree. I keep hearing praise in regard to the same talking points of "Fun" and "Performance". That's hardly my mindset when I am thinking about a V6 versus the 4cyl w turbo. My mind is focused on those occasions when I am traveling through the steep grades of the foothills and the mountains. It would be at those times when no amount of the hype about "fun" is going to cut it with me if the 4cyl begins to struggle against an actual real challenge and the power is not going to be there for me when I'm on that grade. I don't see myself risking that kind of money on a Honda for a 4cyl despite all the hype of the new design. I live in Utah at 4200 feet elevation. A turbo up in the mountains will work better because a naturally aspirated V6 looses power the higher you go. A turbo conpensates and spins faster to maintain pressure so the torque at sea level or 8,000 feet will be the same. The most current dyno test of the 2.0L turbo Accord is actually getting 300lbs of torque at the wheels which I guarantee is more then a V6 at sea level let alone at elevation. So it never feels sluggish so to speak the higher you go. Could not agree more! Just picked up a 2015 V6... Along with my brother and an uncle, to go along with the 2017 V6's my Father and another uncle just bought last year. Really is too bad, it was so nice to not have to go do a bunch of research and test driving. I'm happy to hear you feel that way! Not true for me. I prefer the smoothness and efficient of the 6 over the turbo 4 which is fine for the civic but not for me! I will. I will miss the V6 when I have to replace my current '15 Accord, and yes, I've driven both '18's. Just quick bit of correction. The only DOHC V6 Honda ever made in production was the Acura NSX with 4 cams total. 1 intake and 1 exhaust cam per cylinder bank. The accord V6 is a SOHC with 1 cam per cylinder bank with intake and exhaust on each cam. DOHC was available on Honda 4 cylinder on the SI, type R, S2000, European accords and k-series motors. I wish that Honda/Acura made another V6 with dedicated intake and exhaust cams. But alas the 1st gen NSX was the only recipient. Trying to get back v6 is like trying to glorify the days of RadioShack. Sure they were all fun and all but that's the past. You all speak all high and mighty and yet you don't look at the biggest factor; that is the general consumers. Honda will not cater for the 5% when it will only make them lose their investments. They want profit and profit goes to the general populace that could careless about the engine. Live on with the present rather than dreaming about the past, otherwise you will get left behind. you are absolutely right. only 10% of accord buyers opted for the v6 . I have read article after article stating V6 sales to be around 20% of Accord sales, which with the Accord volume, is a lot of people. Your point is valid, but Honda does cater to the 5% by making the 2.0T version of the Accord. Although you say the take rate is about 5%, Toyota sold about 21,000 V6 Camry cars in 2017 (5% of overall sales) or about 42,000 V6 Camrys (at a 10% take rate) and the new 2018 model is increasing in sales. In November, Toyota's Camry outsold the Accord by roughly 30% in the U.S. That is the voice of the consumer. Couldnt disagree any more with that statement/thinking. I will miss the v6, but won't stop buying the older gens that still have it. I have a 1998 Honda Accord Coupe v6 and love it. It had bolt on parts and base Acura tl wheels, got a new car now but kept it just in case so i can still let vtec kick in. I have been a Honda fan since 1998. We leased 3 Accords, my 2016 I have now, a 2000 Civic, a 2006 CR-V and my long lasting but totaled 1998 CR-V that had 307,000 miles on it before the accident. BY or not the Accords always had plenty of power for me and the gas mileage was excellent. My 2016 Accord is super economical and plenty of power for me. I'm contemplating a 2018, but my wife may not agree on paying forever on a car I'll never really own. But they are a gorgeous car and I will never buy anything else. I love to see that there are die hard Honda fans still out there! 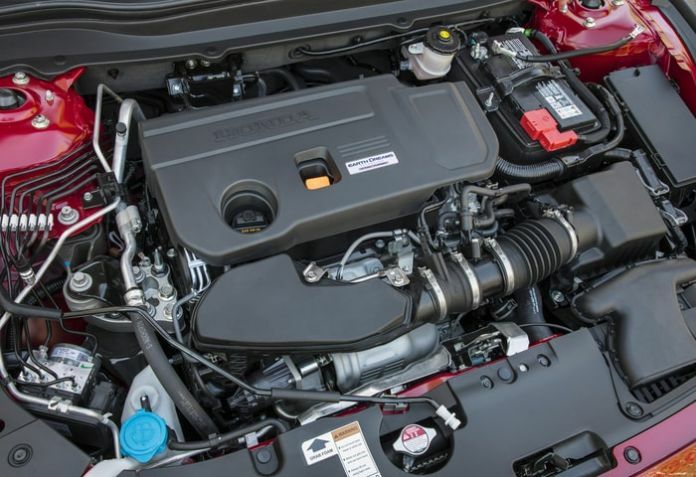 Honda's new V6 engine in the up-powered 2.0T version of the 2018 Accord has the same combined fuel economy as the Toyota Camry's V6, 26 MPG. Motor Trend tested them both and the Camry and Accord have the same 0-60- MPH times to within a tenth of a second (about 5.7 seconds). The Camry also has a lower percentage of its weight over the front wheels and is within about 90 pounds of the Accord's total weight.. The Camry emits slightly less CO2. If the four-cylinder Accord has moved the bar, I can't figure out how (and I have driven both of these 2018 cars). This comment is submitted by a 2-time V6 Accord owner who has never even shopped for a Camry. I'm owning an 2017 Accord V6 EXL; it's a really good machine and I love to drive it every single day. It's sad when the Honda killed it. I guess I have purchased my last Honda. After owning 3 Honda V6 Accords in my lifetime, I could never go back to a 4 cylinder engine. My first car was a 4 cylinder, but not a Honda. I think this is a step backward for Honda. Big mistake. I used to buy a new Accord v6 every year for my wife.... with out the v6....I will have bought my last Accord in 2017. I’m going to switch to the Genesis G 80 instead for this year. Better equipped and v6 motor.....and yes more expensive. As long time honda customers I continue to watch as Honda makes one mistake after another. First they discontinue the only midsized sporty x2 coupe Honda Accord (of course the S2000 and Prelude have been long gone) a mistake, then the smooth V6 gone too ajd replaced with a Turbo?!? (Turbos are affectionately referred to as Extra Boat payments, do not lend to long term reliability on avg) I happen to drive a Acura TL SH AWD...why because of the amenities aka comfortable dual power seats etc. Its got great power at 305hp...so what does Honda replace it with? The TLX (which was supposed to replace the TL and TSX) available with a 4cyl ok but the V6 has LESS Horsepower than my TL and given I drove one, the TLX is a pooch in comparison (as the service techs even agreed!) Seats in the TLX? Thin and no as supportive, door panels/controls not as well laid out...and compared to the competition the dash is a bit of a mess. My family has been driving Hondas since 1978, and my Parent also agree they are making BIG mistakes THUS when we sre ready for new vehicles will be forced to shop the competition (from Japan) Toyota nor Nissan arendiscontinuing their V6......Honda are you listening? Long time loyal customers feel you're loosing it and plan to purchase elsewhere! Great Business Plan Honda! The buzz is that the V-6 over 2.0 Turbo was a mistake.The sales on the new Accord(specifically,the Touring trim) has been popular with older and new Accord owners. I know because I sell them.And for those who are against,new tech,engineered 4 cyl that develop same same horsepower and better fuel economy should stay in the 1970s. And frankly I bet RV never drove the car! For the record I am in no way against "New Tech" but feel that the V6 should be an option....opps wait you must have forgot, IT IS in the Premium Honda Brand ACURA! Mind you the TLX, the RLX and of course the NSX all come with or are available with V6's and some with electric motor/assist as well. SO I guess those are all "Low Tech" and caught back in the 1970s as well? I for one have hoped Honda would beat the other car makers to market with an all electric car with real world battery stamina. (Clarity? 47 miles isn't there sorry Honda CAN do better than the likes of GM) (Heard of Tesla? Yeah I've drove many, which are pretty amazing!...Perfect? No but before you bash, have YOU ever driven say a P85/D? Price you say?...That too is changing with the Model 3) Again I have hope and even expected Honda to outdo ALL the other companies! (I've promoted Honda as a brand for YEARS, heck My Dad bought his first Accord 4cyl/Stick in 1978, old school yes, but an amazing economy car, but far smaller/lighter than today's Accord and yes I know less HP, but the advent of the smooth Honda V6 Put the Accord in a better class, that 4cyl turbos then , nor now can not match.) Honda IS still selling V6's in the Odessey, Pilot and Ridgeline, and given at least some of those share their platform with Accord, Accord's size warrants the availability of a V6, which I'm willing to bet will return! Is it then that Honda is pushing buyers who want a V6 to the Acura brand? Possibly but the point is, the smooth V6 should be an option in the Honda Accord Lineup, and I hope you have a better week as to not get so snippy when a long time Honda Customer/Promoter gives feedback that matches dozens of others who are providing the SAME feedback! Born in 1980, have driven both new engines. Will not buy one.